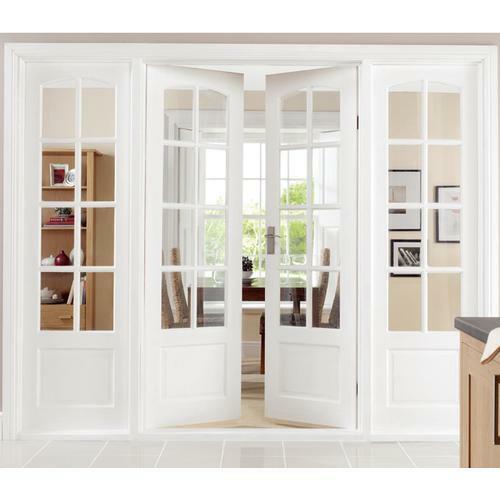 Do you have a pair of French doors that need a new look? It can be daunting task to figure out how exactly to paint those beautiful French doors with all that glass. So here we have it all broken down on exactly what you will want to do to make it as easy as possible! Before you do anything you will want to remove the doors from their hinges. This will allow you to keep them even and steady while performing the paint job. It also will allow you easy access to all the nook and crannies of the doors. Lay out some plastic painters sheets where you will be painting, and set up two saw horses to lay the French doors across. This gives you a flat area to work. Once you have the doors laid out on the sawhorses. Be sure you remove any hinges, handles or metal from the doors. If there are any cracks, be sure you repair them prior to beginning painting. Use the putty to fill the cracks and holes. Let completely dry and then use sandpaper to smooth the surface. Using a damp cloth, remove any of the dust that might be left behind after sanding. To prevent paint from getting onto the glass windows, using painter’s tape tape off the glass panes. As with any painting project, be sure you use a primer to get the best results possible. Simply paint the door with your chosen primer and wait to dry completely. Using long strokes and going in the direction of the wood, apply the primer. While one door is drying, apply the paint to the other door. Depending on the previous color on the doors, you might need a second coat of primer. Use your best judgment. Once the primer is completely dry, you can begin painting with your chosen color. Using the same methods (long strokes, going with the grain of the wood) apply your new coat of paint. Let dry completely, and apply a second coat. Be sure you paint both doors evenly, and if your doors face the outdoors, make sure to apply a weatherproof sealant. The sealant helps to protect your new paint from rain, sun & snow. After the doors are completely dry, put all the hardware back on. Remove all of the painter’s tape from the glass, and double check your work for any missed spots. Hang your doors back in their location and enjoy the look of your newly finished French doors! How To Get Mold Out!